Reflex actions are involuntary and instantaneous movements in response to stimuli. A reflex or a reflex action is an instant movement in response to a stimulus. 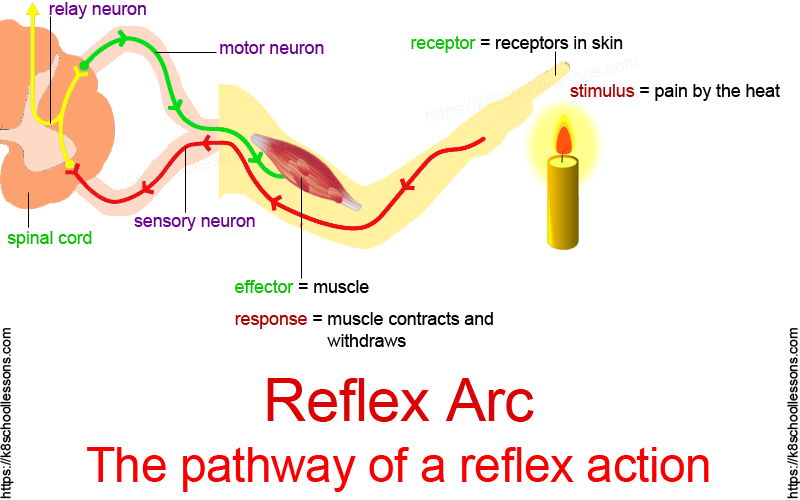 Some natural pathways called reflex arcs act in an impulse before the impulse reaches the brain, and this makes a reflex or a reflex action. Have you noticed that sometimes your body reacts to something automatically, even before you think about it? What if a ball comes flying at your face? Your eyelids blink shut quickly and you may even scrunch up your eyes or bring your hands up to your face for extra protection. These quick movements are called reflexes and they protect your body from harm without you even having to think about it. 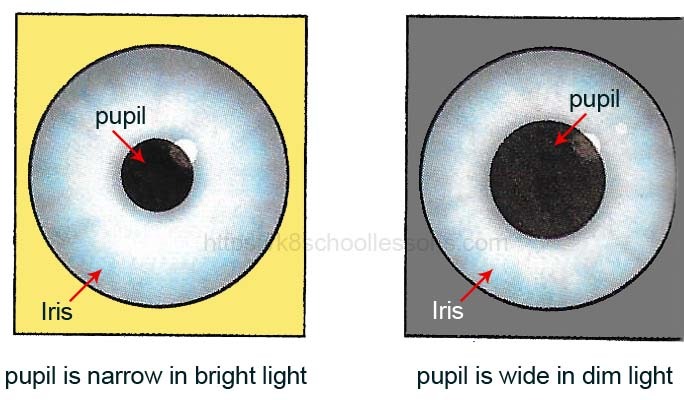 Reflexes or reflex actions take place in your body without your brain being involved. You don’t need to think for a reflex action to happen. What is your reaction if you touch something hot or sharp? You automatically pull your hand away. This is a withdrawal reflex. This type of a movement happens even before your brain has received information from the sense organs that there is a problem. How does a reflex action work? Many reflexes are controlled by the spinal cord. Signals travel to the spinal cord along nerves from the receptors of the sense organs. 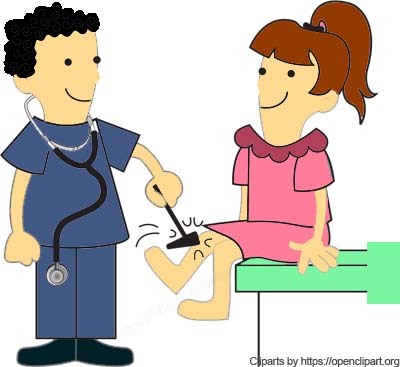 But, even before the information reaches the brain, a signal zaps back out from the spinal cord that tells the effectors, which is the muscles to move. This overall sequence is called the reflex arc. Next we are going to learn about the reflex arc in detail. 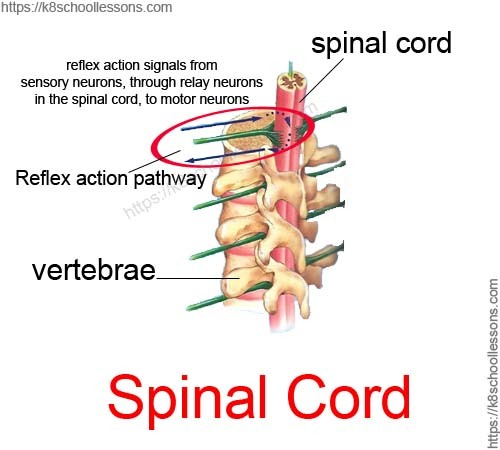 But, before that let’s learn what the spinal cord (Also read Human Nervous System), receptors and effectors are. The spinal cord is made up of bundles of nerves that connect the brain to other parts of the body. It runs down from the brain through a canal in the center of the bones of the spine (backbone). These bones which surround and protect the spinal cord are called vertebrae. Effectors can be muscles and glands. There job is to produce a specific response to a detected stimulus. Electrical impulses are sent by the sensory neurons to relay neurons located in the spinal cord. 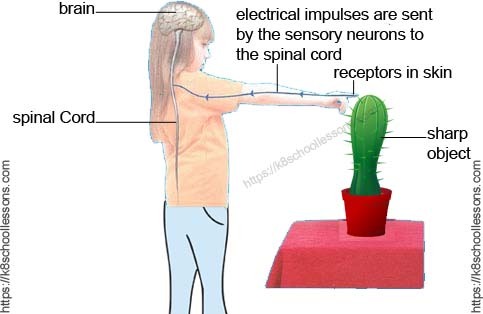 Here, the relay neurons connect sensory neurons to motor neurons. Electrical impulses are sent by the motor neurons to an effector. 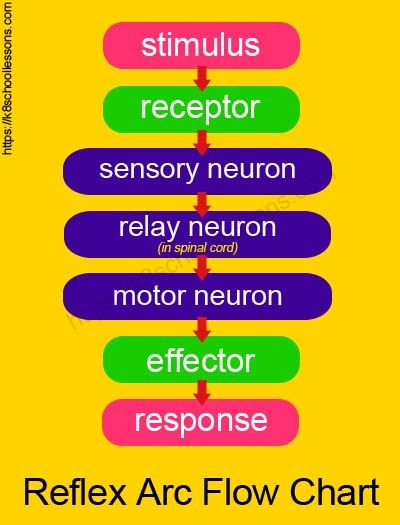 Remember, The signals of a reflex action only travel through relay neurones in the spinal cord. They do not travel through the brain. Sneezing and coughing are also types of reflexes. When harmful substances get into the nose and lungs the body uses them to clear dust and particles out of the airways. This is why it is difficult to control and stop, once you feel that you are about to sneeze. Response: Sudden contraction of internal muscles causing a violent exhalation to blow irritant material out. Cross your legs and tap just below the knee. Your knee jumps forwards even though your brain hasn’t told it to move. 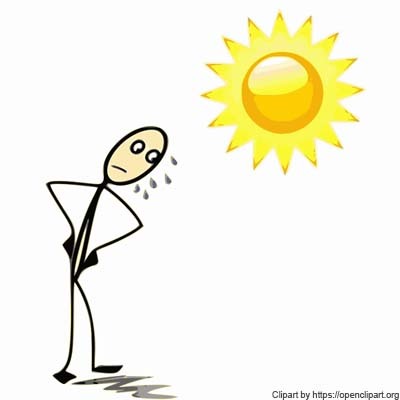 Response: Increased sweat is released to cool body surface down. A baby’s brain is not developed to think and do something. So, babies are born with many reflexes that they need to survive. These are also called instinctive behaviours that are not learned but that they know automatically. See if you have noticed the following reflexes on your baby sibling? Startle reflex – When a baby is startled by a loud sound or movement, in response to the change, the baby throws back its head, stretches out its arms and legs, cries, then pulls the arms and legs back in. Babies also don’t have the control of their bladder. This is why their bladder automatically works and make them urinate when it’s full. Runners and swimmers need good reflexes as they need to react quickly to the start gun. Tennis players may have less than half a second to react to a ball coming their way.